Sonic Mania refers to what Sega hopes/thinks the fans will feel when this game releases. Sonic Forever. Sonic Madness. Sonic Fever. Sonic Lunacy. Sonic Ebola. Sonic Bubonic Plague. Uh, so anyway. The Collector's Edition box was...well, I knew it was going to be big, but I didn't realize how big. Craziness! Just downloaded this now. I had the Collector's Edition coming but I backed out to save money. What I want is new glorious Sonic gameplay. I don't need more things I don't have room for in the home. So I am still stoked for today! So, how big is it? You should snap a pic of something for scale. Like a coffee cup, the Loch Ness monster, or a scale. Small bug in the Switch version of the game (possibly just the European version): the screenshot and Switch menu buttons are either slow to respond or don't at all. Not a huge deal, and something they'll presumably fix in a patch. I wonder what issue(s) caused the delay of the PC version. American version here. Slight delay (maybe a second or less), but nowhere near that of the European version. 8 hours until I contract Sonic Mania. @GameDadGrant You should place a 3DS by it for comparison. Collector's Edition is like chest size. Can't get arms sround it. My bro got it sent to work and I'm dying of jealousy. I'm also not into spending money on collector's edition stuff much/anymore. 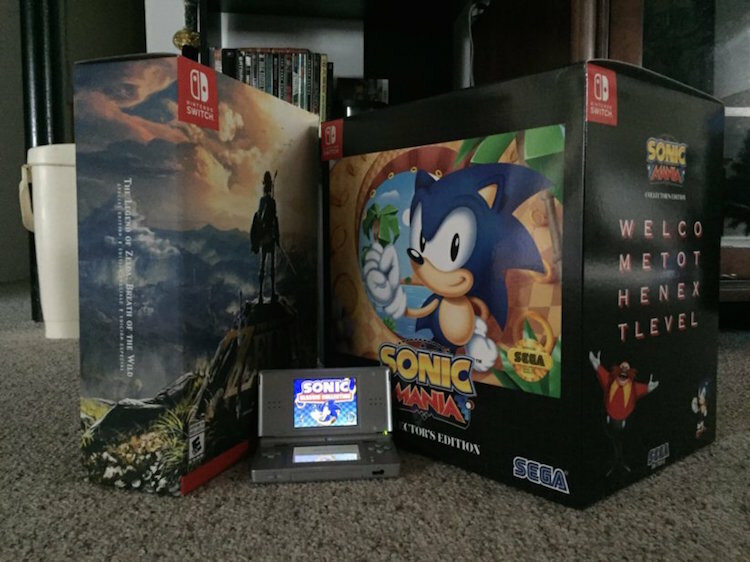 As you can see, it's juuuuuuuuuust slightly shorter than the The Legend of Zelda: Breath of the Wild Collector's Edition Box, but has far, far more girth! I took (one of) my DS Lite (with Sonic Classic Collection playing on it) and put it in between the boxes. Hopefully that gives you a good idea of its actual size. It....ain't small! 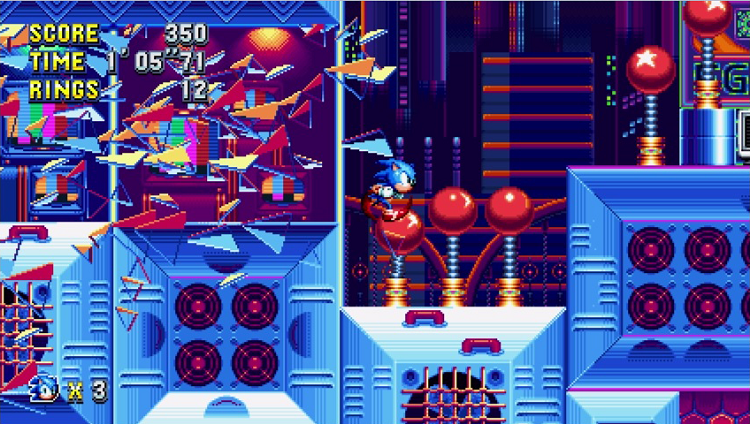 Well the Chaos Emerald stages are easily the best in the franchise. It's really cool that you actually did snap that picture! That IS really big! @GameDadGrant Wait, there's a Sonic Classics Collection on DS?! I might have to get in on that! -- I agree with @chrisbg99, the new special stage is a blast. It's also pretty dang tough. 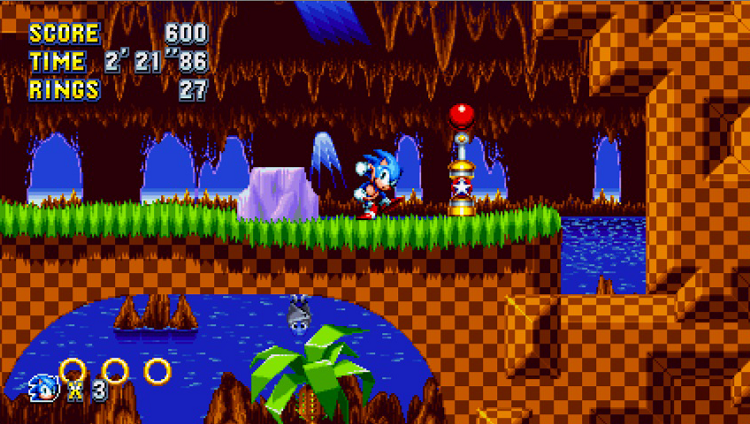 -- We spent almost as much time playing Blue Spheres as we did Sonic Mania. Neat how the medals you get from it unlock new (old) abilities for Sonic. -- The game's actually pretty glitchy, at least in 2-player. In the very first stage we got stuck by a camera glitch and had to restart. There's also a lot of times where Tails got caught between level geometry, or stuck in a special state (like hanging sideways) and couldn't move. -- The game's not easy! I feel like there's more tricky platforming in this game than the Genesis games, though hardly any bottomless pits or mashers yet, so that's good. On the other hand there are more than a few sections where you can just hold right (or down) and whiz through a good chunk of the level. Classic Sonic gameplay. Neat level and boss gimmicks. FILTHY with fanservice and references to obscure Sonic games and other Sega properties. Yep, I love this game and am going to put a ton of time into it when the PC version comes out. I "get" Sonic now. I love this. 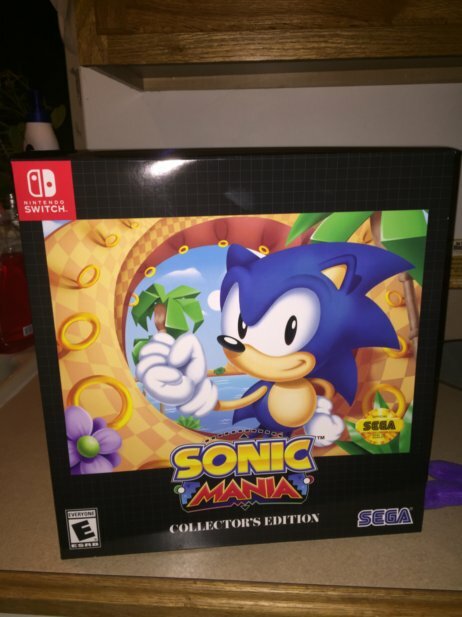 I have Sonic mania right now. Sonic Mania honestly feels like how a proper 2D Sonic game might have felt on the Saturn. I mean I don't know how much resources the game is tapping into on consoles but it can't be anything particularly great outside of resolution.